If I had to describe myself with one word, that word would be LEARNER!!!! Vickie with Atticus and Ziggy. Ollie was a little camera shy that day! My three favorite things in the universe (after family and friends of course) are music, art and literature – with equal importance. 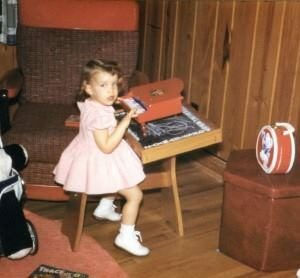 I began reading and playing the piano at age five (that was a busy year for me I guess). Both have stayed with me, I begin EVERY day with a book and a bath. My grandfather owned a music store, tuned pianos and my aunts recorded gospel music. Currently I play the piano for people in an adult day-care center. But, I always thought something was missing. When I saw the book, DRAWING ON THE RIGHT SIDE OF THE BRAIN, I thought I should try this, after all I am left-handed. I found the missing piece!!!! I am married to a professional photographer and teacher, Joel Conison (he took all the photographs of my work) and we live with our three dogs in Decatur, Georgia. I gave historical tours in Atlanta ; THE DRUID HILLS TOUR – the neighborhood where the movie DRIVING MISS DAISY was filmed, and THE FOX THEATER – one of only a few atmospheric theaters still in existence in the United States. I’ve described myself as a symphony going recovering punk rocker (I named my dog Ziggy in honor of David Bowie). In fact, I saw David Bowie every time he came to Atlanta after 1973! I have worked on over 15 homes for Habitat for Humanity, three of which were built totally by women! I got pretty good at putting in base molding! What is my favorite book? Hard to say, but I did adopt a dog named Atticus. I will NEVER turn down Mexican food!